Revisiting one's youth can be both scary and beautiful. And hot. What? According to Google/Blogger stats, this blog had 1,873 page views last month. And while Blogger stats are about as scientifically sound as dog years, I'm gonna go ahead and conservatively estimate that there were 50 page views by actual people last month. Though to all of you incredibly attractive "bots" out there, you feel free to come do your dirty deeds on this page anytime you want. You're making me look good. Having realized now that this blog is about a step or two away from being a cultural phenomenon, it seems incumbent upon me to create more "bits". As of now, my only consistent bit is the "Playlist of the Week" which is sometimes weekly or monthly or whenever I've had a little too much to drink or a combination of several factors. Either way, I think I've stumbled upon a worthy bit idea that may have some decent mid-to-long term legs. The other day on Twitter (yes, I shutter as I type those words), I engaged some of my fellow Twitter music geek friends (ah, modern romance) with a very simple question. To paraphrase: What is your favorite year in terms of album releases in your lifetime? Provide examples. My friends all provided some good strong good arguments for their favorite years and it prompted me to come up with a new playlist idea. Take a truly great year in music and pick twelve songs--one from each of your twelve favorite albums of that year--and make a playlist. Simple enough. 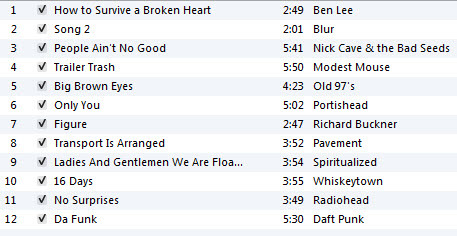 The only rule I will try to adhere to is that I don't typically like to select songs that have been on previous POTW's. This is the first in a series (I'd love to say many, but I wouldn't argue that there have been "many" great music years in my life). 1997 was still undoubtedly filled with even more classic greatness than the albums listed above, but I like to stick to "dozens" for whatever reason. Twelve albums, twelve great songs. Some you've definitely heard, others you may not have. For some (like me), it's a scarybeautiful trip down memory lane. For others its a discovery of new music. And for a third group, it's a reason to argue with me and that's fine because I love it and you love it and when are we gonna stop kidding ourselves we were born to do this and this is what makes us who we are and possible giggity, right? Right. Enjoy real hard. Quick Spotify gripe: I created the Spotify version of this playlist and it was complete when made yesterday. But TODAY--at time of blog publication--two songs (by Ben Lee and Portishead) are suddenly no longer available in US. What a load of crap. Spotify is great except for when it's not. This is why I recommend the 8tracks version which can be played on your iPhones and iPads (AND has an app if you're so inclined) by clicking the first link below or the embedded 8tracks player found directly below the tracklisting. I've still included the Spotify version, but keep in mind that it is two tracks short of being complete. To listen to this playlist in Spotify, click here. Everyone else, press the play button in the box below the tracklisting. Playlist of the Week: A Dozen Gems in a Gem-Worthy Year: 1997 from RobRobRiot on 8tracks.